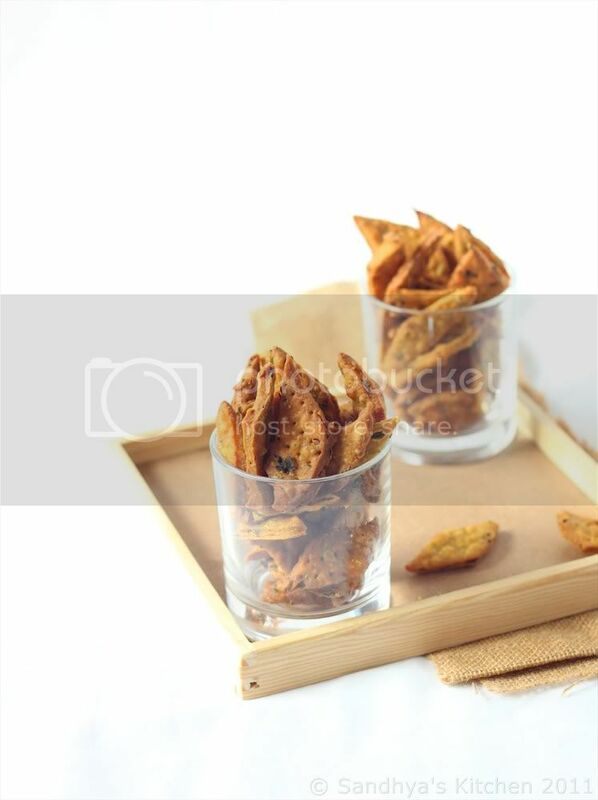 Fried Savory flour crispies also known as Namak Pare can be easily made at home. Make them ahead in time for Holi, Diwali or even T 20 cricket. I have got Nostalgic memories linked with this Savory Bite.Lets go flash back about 12 years to Mumbai.We had a story about Kadu manga( Small mango in chilli gravy pickle) in our english text books in Mumbai ( guess in my 8 th standard) . No one had ever heard or seen it ever in my school. I promised my friends to get it to school one day and let them taste wot it was. My friend Deepali just loved it , that she told me lets do a pact. You give me 1 bottle of Kadu Manga and I get you one Box of Methi Cuts ( Cant recollect the right name for it ).. Its also called Namak Pare..
Namk een means Savory and Para – fragment / piece…. Many people also call it Mattri..
Its more than 12 years ever since I had it .. and now that diwali was round the corner ,I wanted to make this savory delicacy. I happen to tell my Ma in all broken words describing this savory. She instantly told me its Namkeen Pare..
On the diwali day , this savory was just being enjoyed by friends like hot cakes. Wash Methi Leaves a couple of time under running tap water and pat dry with kitchen towel.Chop it into small pieces and keep it aside. Mix Wheat Flour , Plain Flour , Green Chillies , Methi Leaves , Turmeric ,Cumin Seeds, Salt , Water and knead into a hard dough. Melt unsalted butter or hot oil and add it to the dough above. Knead a couple of times with hand and obtain the dough. Divide them into equal balls. Pinching each ball one at a time , flatten & roll it out to 1/4 ” thickness using a rolling pin.Using a knife cut it into diagonal lines ( diamond shape) or the desired shape you like. Deep fry them in a low flame until it turns brown. ( It took me atleast 5-6 minutes to deep fry each batch) . Drain them in paper kitchen towel . Once cooled store them in an airtight container. Serve them in combination with your favourite sweet for any occasion. Dough needs to me much harder than the chapathi or poori dough. According to my mum , the size of the diamonds needs to be much smaller. ( This was the first comment she gave me after I made them n showed her over the webcam) . I am a regular visitor to your site. I like this type of recipes, simple, fast to make, keep a jar full to munch any time, and above all reminds me of Mom. Of course it used to be just plain salted ones or with Azwain or just crystallized sugar coated. @ Tina.. 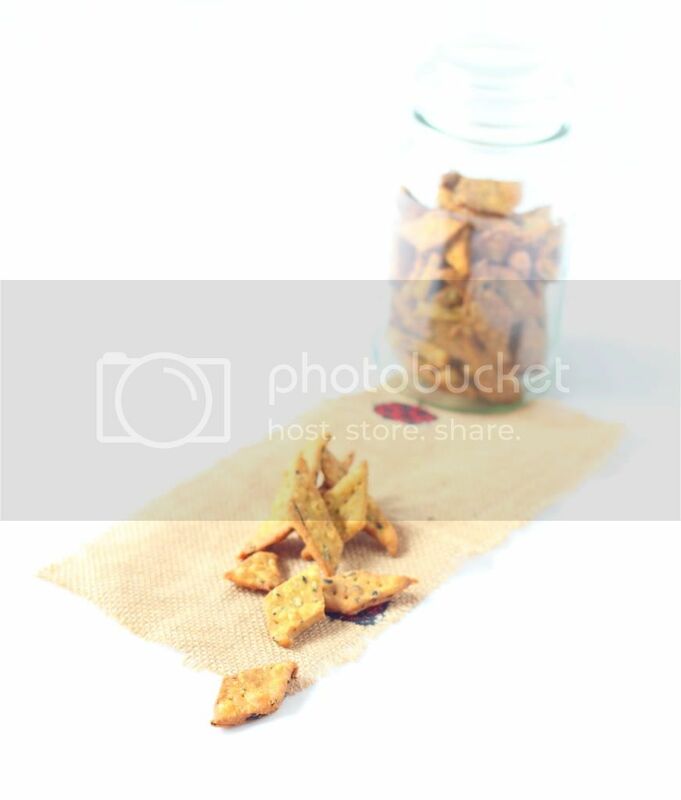 It is very crispy.. Can be stored for a month in airtight container. Usnish . Thanks for dropping by. I like it this way . .Also enjoy the sweet one. Its the first time I'm seeing the addition of Methi leaves to this preparation! New one..good!Perfect snack! Shall try this one soon..
wow great snack sandhya. never heard about this.Easy to make too.And ur mom's tips r really useful. Nice snack. Great for tea time! Methi cuts looks crispy and crunchy sandhya!! 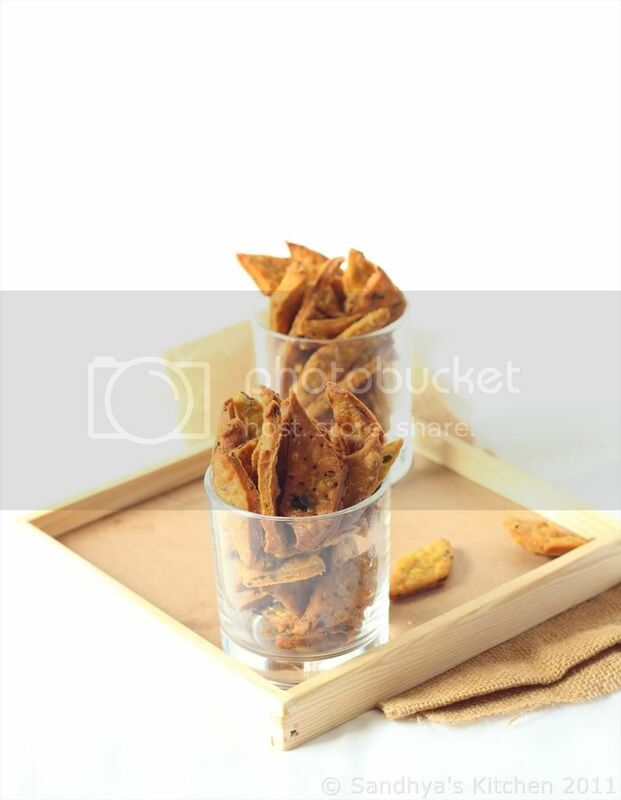 !Perfect snack for tea time..crunch crunch….Nice step by step presentation dear!! Hai sandhya u had a nice blog dear.Methi cuts r very nice .They r really yummy.Even me too prepare this. 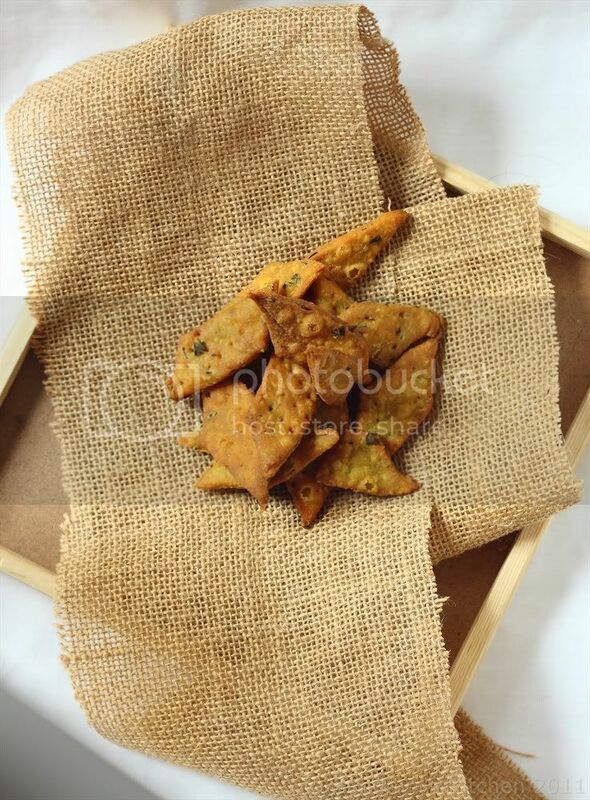 Sandhya ………..methi cuts look yummy dear………..
That's something very new to me…they look very crisp and delicious. oh u made it with whole wheat flour thats gr8 n healthy. crunchy one aint it? I have had this b4 and I so love it. I shud make this soemtime soon. Would love to have them with a hot cup of tea, send some please. Methi cuts looks nice nd crisp, liked it. would try it out. Just back from a small Diwali Break, missed your lovely posts, just going through them ! What an easy snack idea. Love those crispy methi cuts very much. Nice recipe dear. Very interesting recipe, sounds all healthy to me. Its quite easy… n can be stored for months… and enjoyed with a cup of tea everyday!! @ Kanchan : Thank you for your wishes. I had a rocking celebration .How was urs? @Pria.. : Welcum to my blog . Thanks for following.Will c u often. @Rohini : Yeah yet another methi post. I have one more post lined up.. BTW.. I picked up one more bunch of methi today.. Let me see wot I can present! I love methi and these methi cuts looks so YUM! this is a new dish to me.. looks crisp..
Congrats on winning the Recipe of the Month,in Recipe for 7 stages of life: pregnancy event !! Buddy, It's my turn!! Just stopped by to say that you’ve been tagged. Please collect your award dear!! Hey Sandhya, congrats on winning the event "Food for 7 Stages of Life – Pregnancy" dear!! Interesting one, looks great and yummy. i am first time here n loved these methi diamonds……we make a matthi of methi which is slightly similar n i know it's so very fragrant..